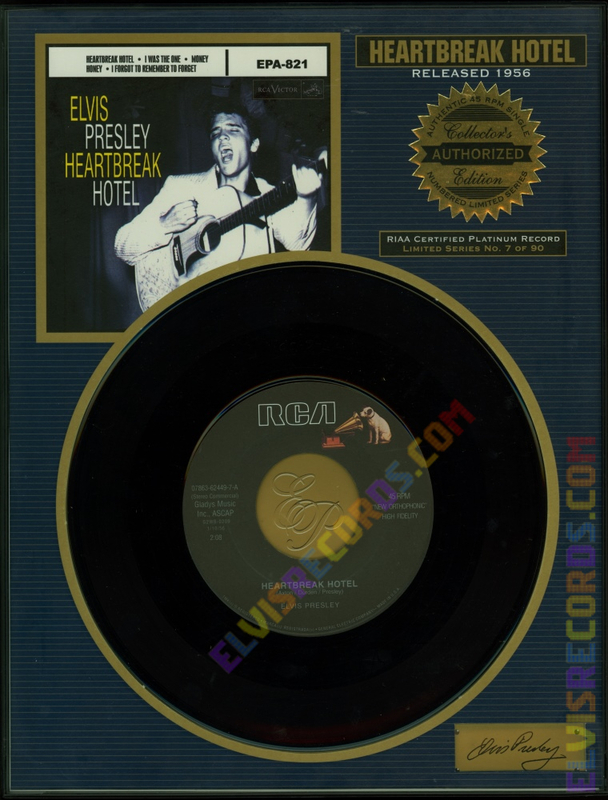 Cover: Actually, this is a plaque composed of a piece of glass with black plastic frame. Breakdown: The removal of the glass is easy, it pops out of the top of the frame. 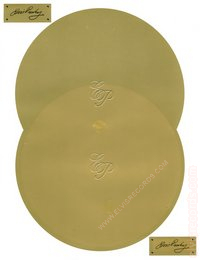 The next layer is a piece of white cardboard which has a graphic featuring an interpretation of EPA-821. 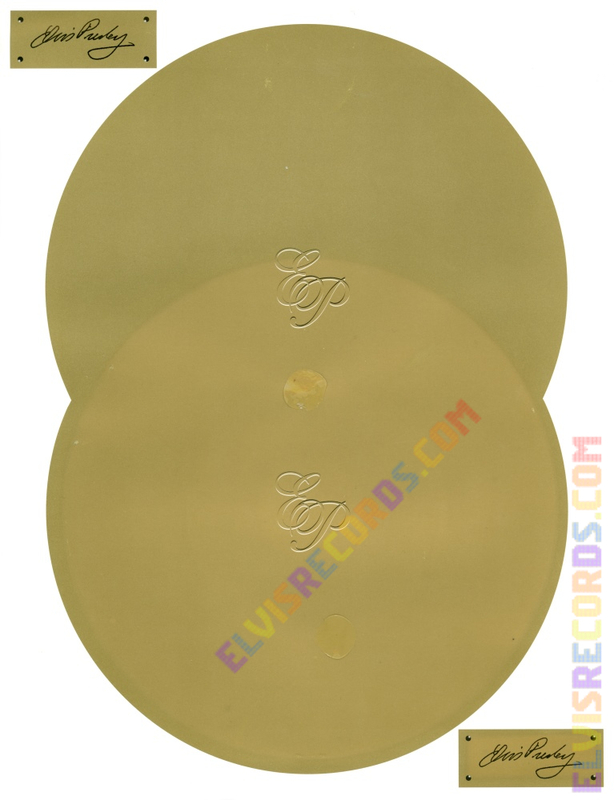 The next layer is a white gloss piece of paper with two gold intersecting circles centered with two Elvis Presley signatures in gold boxes positioned at the upper left corner and lower right corner. 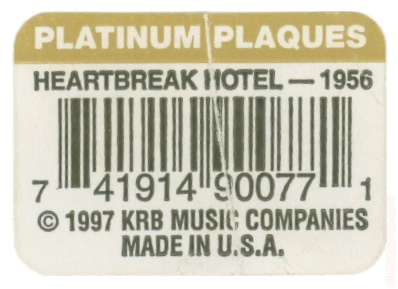 The back of the white paper has a UPC affixed which reads PLATINUM PLAQUES, HEARTBREAK HOTEL - 1956. 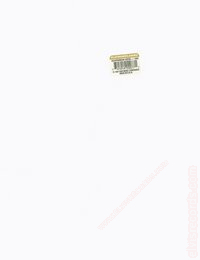 7-4191490077-1 (c) 1997 KRB MUSIC COMPANIES MADE IN U.S.A.
Disc: 447-0605. 1976. Gold Standard. Black label, dog near top. Gold Standard on side. Disc: 1997. Black label, dog near top. 45 RPM NEW ORTHOPHONIC HIGH FIDELITY on right side. 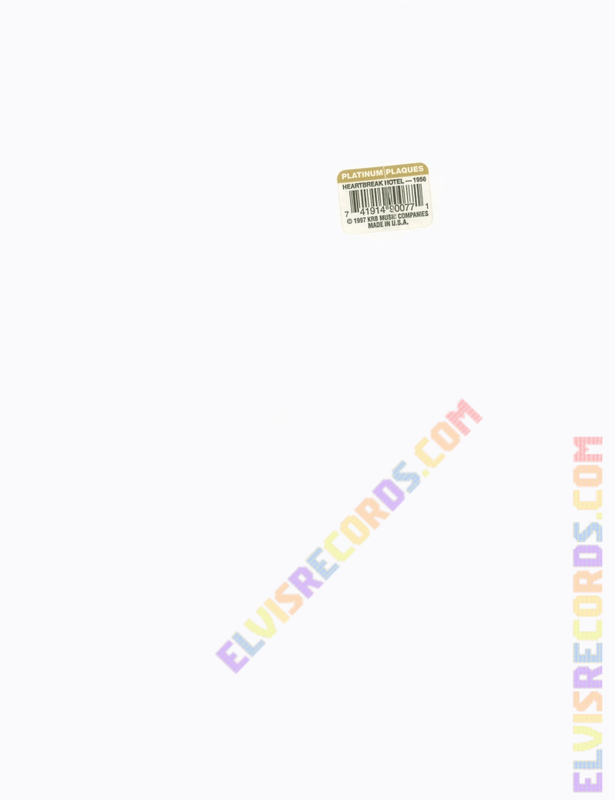 Catalog number on left side with (Stereo Commercial) directly under catalog number. Gladys Music. Label on the back side is blank as it was never intended to be seen. There are so many differences between this release and the 47-6420 and the 07863-62449-7 (1992) releases that this record deserved its own entry. The original 47-6420 has Tree Publ. Co. as the publishing company. This release is Gladys Music. 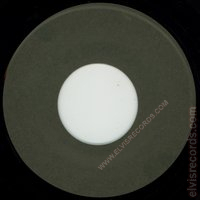 The original release has G2WW-0209 for the matrix number for the 7" mono 45 RPM, where this release is G2WB-0209 which is correct for the 10" mono 78 RPM. 47-6420 has Heartbreak Hotel paired with I Was The One. 47-7420 is hand etched into the trail-off area of the vinyl and play tested true. 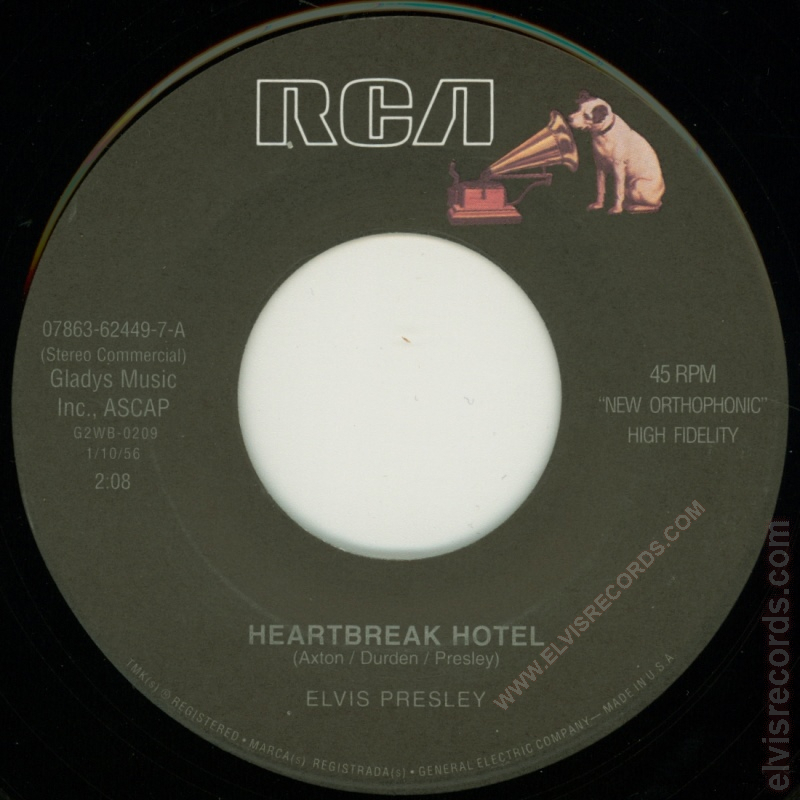 However, the Heartbreak Hotel side has the catalog number of 07863-62449-7. 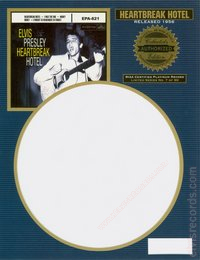 Where when last used in 1992 on the silver label, the flip-side was Hound Dog. 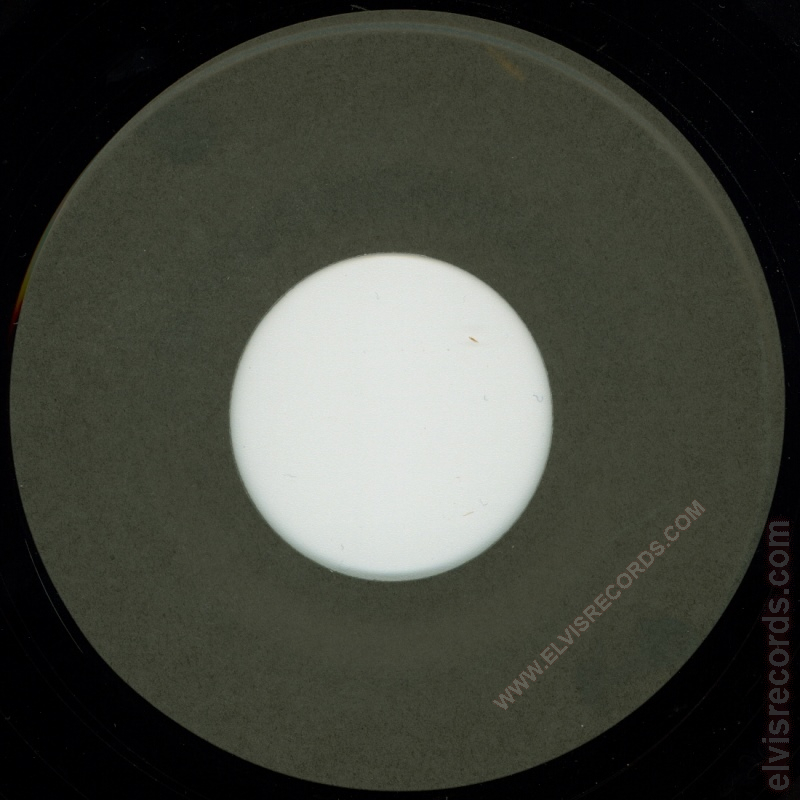 The copyright information on the bottom of the label is reminiscent of the 1960s black labels, dog on top labels. One final oddity. Stereo Commercial is not consistent with NEW ORTHOPHONIC HIGH FIDELITY, which is actually a reference to Monaural. Is it stereo? Further more scientific methods need to be used, however, play tested by ear only, seems to play stereo. 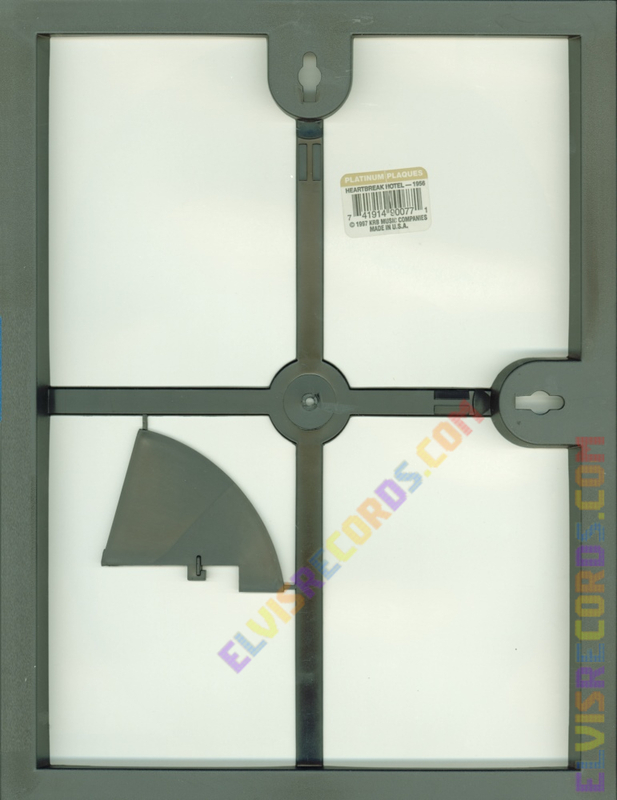 A possible reason for the existence of this record is that the stock copies of 447-0605 were depleted and this filled the final orders. Just speculation. A quick Internet search reveals out of 10 or so copies of the Platinum Plaque for this release, 3 exist with this label and pressing variations. This record was brought to my attention and discovered by Paul Dowling of World Wide Records in September 2014. After realizing that the late release plaques have yielded other interesting anomalies, I researched this record towards that direction and it did not disappoint. This record has eluded detection for nearly 17 years, it is rare!